Last night's Emmy awards left a lot of genre fans feeling disappointed: Lost was snubbed left and right, along with True Blood and a few others. But there were also some amazing geek shout-outs. 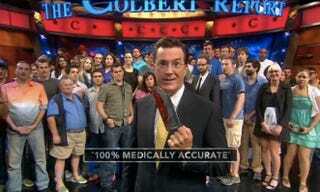 Strangely enough, one of the highlights of the night, besides Ricky Gervais handing out beer to the front row, was Stephen Colbert's Human Centipede name-check. While accepting his nomination for writing team on the Stephen Colbert Report, the comedian claimed his writing team was "the greatest staff in the world. These people think together, they move together, they act as if they're one living creature. Or they soon will — once I make them a human centipede." A collective shriek was heard round the nation when Moms everywhere googled "Human Centipede." Well played, sir. But all was not, erm, lost. Some beloved geek shows did win some much-deserved praise. First and foremost, Bryan Cranston and Aaron Paul both received Emmy honors for their roles in the science-heavy, meth-lab drama Breaking Bad. Plus Jim Parsons surprised us all by taking home the Emmy for for best actor in a comedy series for Big Bang Theory. Our favorite Daily Show correspondent and PC guy, John Hodgman, was also in attendance, deadpanning his way through all the nominee announcements. And Jimmy Fallon performed a Lost song as Green Day's lead singer Billie Joe Armstrong. It was... OK? Perhaps the best bit of news didn't come from this particular awards show, but a few days earlier on August 22nd. Star Wars: Uncut won the award for Outstanding Achievement in Interactive Media. The crowdsourced production remade Star Wars: A New Hope from a large collection of 15 seconds of fan made clips. Here's a little preview of the end result. Other genre winners at the Aug. 22nd announcements included Robot Chicken's Full-Assed Christmas Special for Short-Format Animated Program and FlashForward, for Outstanding Stunt Coordination. Sound off — was Lost robbed? If not for supporting actor then maybe for best original score? And are we the only ones still pissed off that John Noble of Fringe was snubbed?